This project implements a microcontroller based temperature regulator which can be controlled via the Ethernet port on any common personal computer. As the world becomes more networked, the power of our ability to communicate with many different systems instantly continues to prove it's worth in maximizing utility and convenience. The common consumer now has more options then ever for networking access from hand held Blackberries to common Internet access through a personal computer. Many systems would only benefit from being accessible from any network connection, including many common devices that previously would never be considered to be networked, such as a coffee machine or refrigerator. In our case, we pair a microcontroller with a commercial Ethernet solution via SPI in order to allow the world at large to communicate with the microcontroller, and vise versa. Communication in our device is done through a modified UDP controller accessed via the command prompt and third party software. As a proof of concept, we used the ethernet controller to sample and set temperatures for a closed system. Temperature sensing is done through the analog to digital converter on the microcontroller and heating and cooling is done using the pulse width modulator in conjunction with proportional control theory to allow for a stable transition to the desired temperature. Although the benefits of Ethernet-capable microcontrollers are numerous, we focused on remote sensing and control benefits allowed by the technology. In theory similar systems could be used to cool or heat different parts of a house, office, car, lab or other area that needs remote temperature control from anywhere in the world. This specific implementation was chosen as a possible value-add to a product created by a Cornell graduate student. His product, KoolKennel ostensibly uses a similar methodology of heating or cooling pet carriers. By adding Ethernet capability, pet owners can both check and adjust the temperature of the kennel remotely. The general concept of remote temperature measurement and control has other lucrative applications in a variety of other industries as well. The design was divided into two equally important parts. 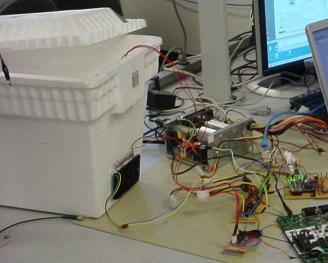 First, we needed the microcontroller to measure and regulate the temperature in our system. We used a thermistor with the analog to digital convector on the microcontroller, and a peltier device attached to a fan to cool or heat our system. Due to the size of our system compared to our peltier device we needed to not only change our temperature quickly but to stabilize at a point. Thus we chose to implement a version of a proportional controller. The peltier device is controlled by a H bridge implementation to increase the voltage driving the device. 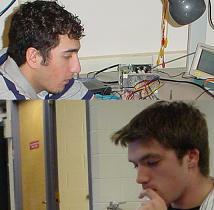 The Ethernet connection to the device provides our only means of communicating with the system and thus was the other significant part of the project. The first step in establishing Internet connectivity was to find a means of interfacing our microcontroller with Ethernet connectivity. Research on similar projects showed that available options included chips from Realtek, SMC, and Microchip. After finding no full implementations for the Microchip controller written on the Codevision compiler, we decided to take the problem on and implement it ourselves. Since the analog to digital converter on the microcontroller could only sample one reading at a time we limited ourselves to using only one temperature sensor in the device. While a larger space might require a sensor network to accurately measure the entire system, our environment was small enough that we could use only sensor to satisfactory results. Additionally, since we used a motor to increase air flow into and out of the system we introduced an irremovable amount of thermal noise into our system that would vary the temperature constantly and thus would keep changing the input to the ADC on the microcontroller. This meant that we would need to introduce a software filter for the temperature reading. Additionally our PD control was limited by this thermal noise, and we can only be as accurate as our reading. Due to our limited budget we chose to make our own boards, but this increased the amount of inductance in the system. Thus implementing the three way handshaking protocol was much more difficult then we first perceived as the analog hardware introduced noise that would invalidate packets. UDP protocol provided a simple enough system that would not be affected by the electromagnetic reflections that might result from the system, and thus determined our choice of protocol. Our choice in using UDP necessitated additional code to interact with the device through Windows. Fortunately, free third party software referenced in the appendix was already written to achieve this. We followed a wide variety of standards for Ethernet, Address Resolution Protocl (ARP), Internet Protocol (IP), ICMP (Internet Control Message Protocol) TCP (Transmission Control Protocol) DHCP (Dynamic Host Configuration Protocol). Ethernet needed to be built so that packets could go in and out; ARP was to be built on top of Ethernet to allow for other computers to discover the existence of our controller; IP needed to be built in order to provide transport of our packets; ICMP was to be built so that we could effectively ping our controller; TCP was to be used as the main transmitter of packets; DHCP was to be enabled so that a router could dynamically assign an IP address to our controller. This report is not intended to be a discussion of these protocols and their complete function as that is a class in and of itself, but we followed all protocols as specified here. While our design intended to enhance existing temperature controlled systems, our novel way of achieving this does not infringe on any patents that we could find. Our choice to use the Microchip ENC28J60 determined many of the hardware choices that we made in our design process. As the device runs off of 3.3 volts instead of logical 5 volts, we originally envisioned stepping up the voltage using a pack of AND gates. Since the Ethernet controller needed to be run at a high frequency we were not able to spec AND gates fast enough that would both fit into our budget and have slew rates fast enough. Thus we chose to run our microcontroller at 3.3 volts as well. Resistors and connections between the ENC28J60 were determined by the ENC28J60 data sheet, as well as the connections between the Ethernet jack and the Ethernet controller. The Ethernet jack features not only transmission and receive lines but functional LEDs as well, who also operated on the 3.3 volts. Since we needed both a 3.3 volt line and a 12 volt line for our H-bridge we used a converted ATX power supply that we already owned. 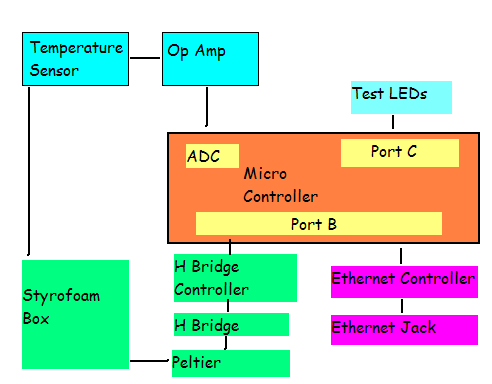 The following schematic shows our overall design of the microcontroller, with all the ports appropriately attached (please click for larger). Measurement of our system was performed by measuring the voltage across a variable thermistor, specced to have 10mV / degree F. The ADC on the microcontroller however needs to be more precise then that, however, and so we fed this same voltage across a simple op amp specced to have a gain of three. With the microcontroller operating at 3.3 volts this allowed us to detect temperatures up to 110 degrees F. Our temperature contained system consists of a large styrofoam box whose only interface with the outside enviroment is our peltier element attached to a fan to increase circulation. This fan, however, generated enough heat that we could not sufficiently cool the system as we had hoped we would be able to. We were still able to sufficiently heat the system above room temperature and keep it there, but due to thermal leakage into our system and the heat generated by the fan we were not able to cool the system below 70 degrees. At first we were not achieving the thermal rate of change that we expected, but including another external fan on the device allowed us to cool the peltier, a differential device, and achieve larger thermal changes including additional cooling. The thermal energy that the fan adds into the system is also seen in measuring the thermistor. The thermistor, pickup up this slight variation, amplifies this variation for the ADC. Since our controller has a limited reaction time to cooling and healing, we needed to slow the measurement of our system as well and decided to implement a running average filter and impose an artificial time between temperature measurements. The running average filter measures the last eight inputs and we use this averaged output to determine the temperature. This allowed us to fine tune our thermal controller to a satisfactory level and reduced the amount of variation that the fan introduces. Before integrating the thermal part of our system we relied heavily on LEDs controlled by the MCU, but due to cost we did not include them in our final design as they only served in debugging purposes. To control the power going into the system we used a combination of the pulse width modulator on the microcontroller and an H bridge. The H bridge drives the peltier with almost four times the voltage and thus four times the thermal gain then the microcontroller can provide on 3.3 volts. The H bridge also allows the circuit to switch from heating to cooling almost instantly. 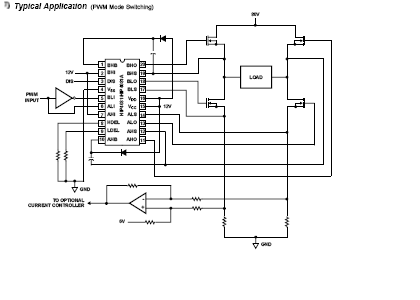 The PWM provides us with a means of controlling the duty cycle on the device, and thus a way to control the power with constant voltage but differing amounts of time where the device is on. The microcontroller interacts with the h bridge via a specifically designed H bridge controller which inputs three different control signals and a PWM signal and drives the H bridge accordingly. We have three distinct states in our design: heat, cool, or disable the system. Using the following provided specs for the controller we attached the microcontroller. The first step in getting the chip to talk to the microcontroller was writing the appropriate methods to implement the operating instructions. Some of this was made more difficult because writing and reading certain registers required extra logic. Thankfully, the methods for writing these registers were fairly easy due to good documentation from Microchip. Identification of the specific registers and which ones required the different addressing methods was done by taking an existing .h definition sheet provided by Microchip for interfacing with their PIC chips and modifying it to suit our purposes. A method automatically looks up the register when addressing it and applies the appropriate write method, with one exception: Physical registers, called PHY registers, have their own write method that must be called explicitly by the programmer. This is acceptable since PHY writes are done a total of once during initialization and never during operation. Once the instruction set was appropriately implemented, the next step was to go through initialization. 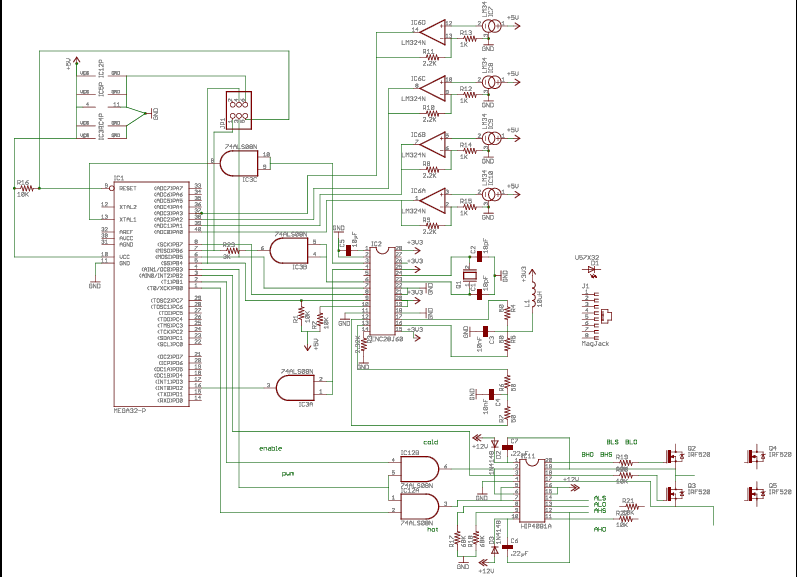 Initializing the chip is a fairly easy process and is well laid out by the datasheet. Additionally, the Microchip implementation of the initialization routine helped in explaining what was going on. The only real sticking point in the process was in writing the filtering commands. 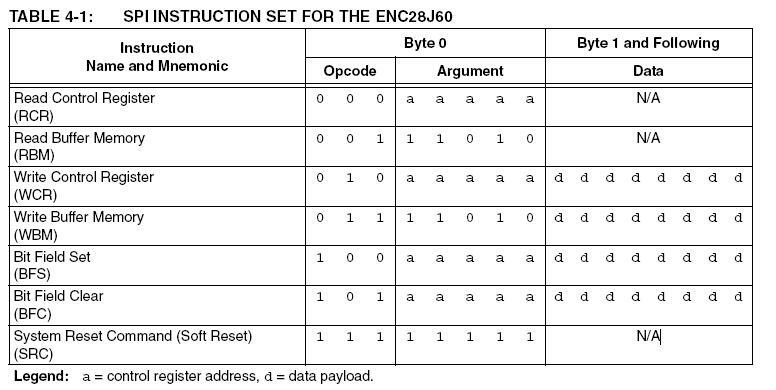 Basically, the filters on board the ENC28J60 allow for packet discard and accept long before the microcontroller sees them, allowing for more efficient use of the buffer memory on board the ENC28J60, saving SPI time, and saving cycles done for reading. Unfortunately, the way the filters were initially set allowed for the discarding of packets that we actually wanted to see. As such, the filter ended up being disabled, since the appropriate settings that would allow our combination of packets to be accepted could not be found. After initialization, the next step was to write Transmit and Receive methods. These were taken directly from the datasheet, and work nearly flawlessly. We had two issues with these: first, we found was that the chip will not transmit the first time the Transmit function is called, and only seems to start transmitting after it is called a second time. Secondly, the microcontroller seems to lose packets sometimes. We were unable to ascertain the causes of these problems; thankfully, the speed of the Ethernet means that retransmitting lost packets is not a huge problem. Building the Ethernet protocol suite was fairly easy: all that needed to be done was switch the source and destination Media Access Control (MAC) address, which is a 12 octet, unique number that identifies the two addresses. ARP was a bit more complicated: to implement ARP, the microcontroller needed to search for a packet that was MAC- addressed to FF:FF:FF:FF:FF:FF and had an IP address that matched its own. Once it found this, it built a reply that would allow for the computer that sent the request to associate the controller's IP address with its MAC address, so any requests to that IP would be sent to that MAC address. IP implementation was a bit trickier, with the checksum field being notably difficult to set up correctly. The checksum consists of the 16 bit one's complement addition of the fields of the IP header. Other IP fields were easier to set. ICMP was also a pain to implement for the same reason: the checksum field did not seem to work properly and required a litany of recoding before the protocol worked correctly. This was compounded by the issue of the ENC28J60 initially dropping ICMP packets, which made debugging an exercise in frustration until the filtering issue was resolved. TCP implementation was initially to be implemented in order to allow for HTTP, or web pages, to be the mechanism by which the controller was accessible. This was highly desirable, as nearly every internet-connected computer has a web browser, which would make the controller ubiquitous and require no specialized software for interfacing. The methodology for connecting via TCP was highly simplified and was to operate on the same principle as Guido Socherâ€™s GCC TCP implementation (www.tuxgraphics.org), which drastically simplified TCP operations. By treating every TCP request as single packet transmission protocol (without delving into the protocol in too much depth, most TCP connections are left open until all the packets have been sent, which requires some careful management of states), much of the complex logic and negotiation can hypothetically be left out. IN our case, we attempted to implement the initial response to a TCP request (SYN/ACK), an intermediate response (ACK), and the final response with data (DATA/FIN/ACK). During coding, we managed to get the SYN/ACK packet working properly, but after a significant time spent attempting to get the remainder of the protocol to work correctly, it was abandoned in favor of a simpler protocol. The replacement protocol was User Datagram Protocol (UDP), an extremely lightweight protocol that is also omnipresent on the Internet in various forms. The plus side of this protocol technology is that the implementation is much simpler than TCP. The minus side is that implementing certain portions of our design, like DHCP and HTTP, was therefore impossible. Ideally all code contained here with referenced software will allow any user to implement their own design. All third party software referenced in the appendix is free for download, but documentation would have to be followed in order to achieve the same results. Building off of our design, we speculate that it would be feasible to implement a GUI Matlab script for ease of use, but unfortunately due to lab limitations with the software we were not able to test and design our own script. Two different interfaces were on our device, one communication line between the microcontroller and the Ethernet line, and the other the thermal interface of our system. Since we were using simple UDP communication on the Ethernet operating, the speed of the device was determined by the Ethernet cord and jack and the speed of the MCU. Since our MCU was operating at 12 MHz as per the specs on the Ethernet controller, this is theoretically the fastest that we could interact with the system, but any Ethernet testing that we did showed responses faster then milliseconds. Since we intended for this device to be a human interface we feel that the device speed is largely determined by the human interaction, but if integrated into a larger C code the speed is again limited primarily by the MCU speed. Thermal control, however, is not limited by the MCU clock but instead by the thermal rate of change of our system. Due to the thermal inertia of any given system, we could only change it as powerful as our peltier device would allow. Fortunately, both the Ethernet controller and the thermal controller ran concurrently so that one would not limit the other. We empirically measured our fastest thermal rate of change to be up to 1 degree / 10 seconds, which we felt was decently fast, as any given temperature could be achieved in a matter of minutes, especially if heated to that temperature. While it took up to 20 seconds for the peltier to achieve it's highest or lowest temperature given a full duty cycle by the PWM, the minimum time that we could change temperatures then would be limited by that. While we experienced an almost 100% accuracy from the UDP Ethernet controller, with only very rare packets being dropped less then 1% of the time, the temperature controller was slightly less accurate. Due to the thermal noise introduced by the fan we were only ever able to measure 2% degree of accuracy. Achieving a set temperature by the controller was also directly affected by this, and the best accuracy we were ever able to achieve was around 3% (plus or minus one degree of Fahrenheit). To increase frequency custom boards should be considered, along with a passive filter between the thermistor and the op amp, although this would have put us over our budget limit. While building our device we kept outside interference both into and out of our system to a minimum. Operating at higher temperatures might lead to thermal leakage, and any nearby thermally sensitive devices would be effected. In addition, if our device were extended beyond the ranges we achieved in lab of 70 to 104 degrees, extreme high or low temperatures could prove to be dangerous to anyone who might enter the contained system. The end result of our design was a workable temperature controller that was indeed able to be interfaced on Ethernet and the Internet at large, but not at the level of transparency we originally set out to produce. Thermal control was not as accurate as we would have hoped, and several suggestions as discussed previously might have helped us increase our accuracy such as introducing a low power fan or more low pass filters in the design. Indeed, even using custom PCBs would have helped by reducing wiring complexity, inductance, and detrimental capacitance. To interface better with the user, we would have created our own custom C or matlab script, but the focus of this project was on microcontroller design. Indeed, although we may reflect on things we would have done differently, we still achieved an Ethernet controlled thermal system! In implementing the Ethernet we heavily borrowed from existing C libraries created by Guido Socher (www.tuxgraphics.org). Care was taken to give credit where credit is due and re engineer where credit cannot be given. All propriety information is documented in the code. In order to make this a marketable product all portions of code originally written by Mr. Socher would need to be re-engineered and implemented differently so as to not violate the rules of the GNU GPL. If our design were to be implemented on a larger scale where the environment contained living beings, then IEEE ethical standards would apply. Our device was not designed for harmful means, but extra security would be needed so that outside forces could not access and control the temperature to detrimental effects. On our small scale, our product could cause no harm as it only operates in a temperature range from 70 degrees to 100 degrees, but if a better temperature regulator were implemented on a larger system where pets were contained, for example, then the network access would have to be secure. In order for the device to be practically implemented more safety features would need to be implemented, such as critical point failure or thermal ventilation.